1: Spending time in an exclusive/expansive/luxorious environment makes wonders on our minds. You will become comfortable, you will enjoy it and you will be programing your mind that it is in these kind of settings you belong! Get your subconscious mindset to work in your favour and do if often! 2: Your girlfriend/boyfriend will love you for it! 3: You will be able to hear your own thoughts as it is usually extremely tranquil and quiet. 4: You will for sure get a very unique experience that will hopefully last for a lifetime! 5: You will experience the authenticity of former times (if you choose your castle with care). 7: If you book well in advance or during off-peak, the cost will be more or less the same as if you were staying in a normal standardized hotel (which most likely will leave you completely impressionless… unless that’s what you want) and you’ll be supporting the continued existence of these impressive buildings! 8: The feeling of spending time in a magnificent castle that is hundreds of years old, beats most feelings of standard hotel rooms. 9: You will be able to write a short blog in less than ten minutes since no one will disturb you and it won’t be very noisy (well you might hear a ghost or two but that should be about it). 10: If (you’re in Spain and) you do your normal morning routines, you will have plenty of time to get some work done before most Spaniards get up and for sure before breakfast, which normally starts at 09:00 and by then you will have accomplished a couple of hours of solid work with 100 % focus because of the tranquility and fresh air around (see picture below of where I wrote this blog). 11: It’s one of few places where you can actually be physically located and strengthen your visualization of what it would be like to live the life of a king (unless you are royal already)! 12: You will be able to really experience your surroundings, so make sure you take in the fresh air, the birds singing, the sun setting, the smell of the flowers and the impressive construction in which you will be spending the night. Every trip is unique but to make the most of your impressions, why not take the road most people don’t take and leave the city once in a while and you’ll be amazed of the experiences you will get! 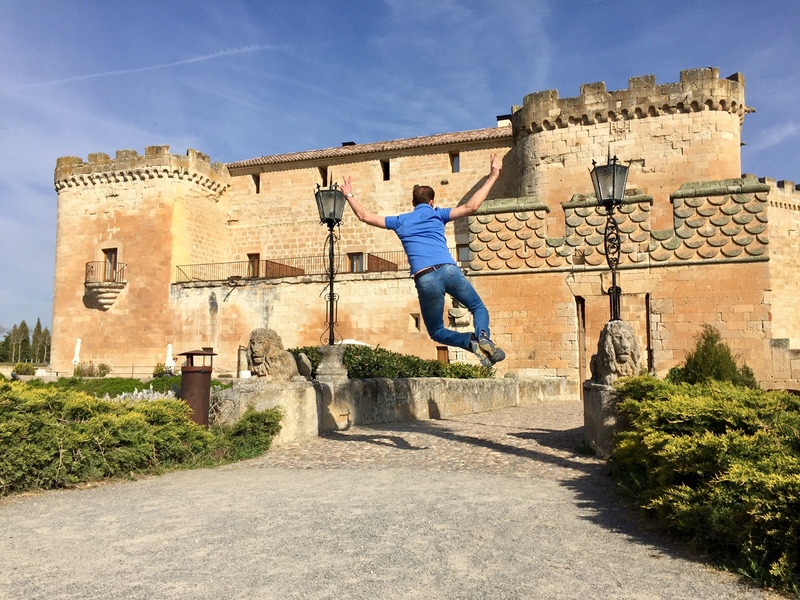 If you ever travel to Spain and decide to rent a car, I would really recommend this castle and on top of the accommodation, it also has a brilliant restaurant with a Michelin star. Bonus: There might not be any wifi in the castle you choose to visit, which means you can give your better half 100% of your attention, scary, I know (but once you get a hang of it, it’s quite nice, I promise)!! Plan a surprice weekend trip for your partner using your Have Fun savings bucket! Why not live like a king once in a while – you deserve it! Do something different and you will always treasure the feeling it gives you, the different perspective and such a positive mind-set. Thanks for your comment and I’ll do my best to stay at as many castles as possible because of the unique experience and I hope that more people take advantage of this opportunity!